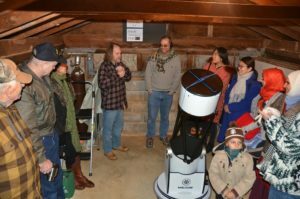 Shoals Astronomy Club meets at 7:00 p.m. on the last Thursday of most months at the UNA Planetarium & Observatory in Florence. March and September meetings are at LaGrange College Site Park in Leighton, and our July and December meetings have variable dates. Please send an email to shoalsastro at gmail dot com or check our Calendar for any possible date or location changes. Shoals Astronomy Club is a member society of the Astronomical League and the NASA Night Sky Network. Use the social media icons to see our public posts. For club correspondence, please visit our Google Groups page.